A vivid and integrated physical setting, capable of producing a sharp image, plays a social role . . . It can furnish the raw material for the symbols and collective memories of group communication. A good environmental image gives its possessor an important sense of emotional security. He [or she] can establish an harmonious relationship between himself and the outside world. This is the obverse of the fear that comes with disorientation; it means that the sweet sense of home is strongest when home is not only familiar but distinctive as well. If asked which areas on campus students found visually pleasant, would you choose the football field or North Village Apartments? What about Hoover Library or “Red Square”? If you said all of them you’d be right. Now, can you guess which dorm is at top of the list in the visually unpleasant category? Ok, maybe that one was too easy. And, no, I didn’t go off on a wild hare and start polling random students as they passed by the office, interesting though that might be. I did, however, drop by Dr. Linda Semu’s Urban Sociology class to watch their group mini-documentaries about places on campus they identified either as important physical elements, visually pleasant or unpleasant, or a “most frequented” place. While Linda has taught this course for several years, last spring she decided it needed a little fine tuning. As part of the study of Lynch’s elements of imageability students work in groups to complete a multipart assignment wherein they examine the physical spaces on campus while looking for specific characteristics. Are there places that especially serve to facilitate a sense of community? Are there buildings or landmarks that are aesthetically pleasing and memorable? What areas are best at marrying human needs (psychosocial processes) to physical surroundings? In past semesters students completed this aspect of the assignment “on paper.” Linda wanted to find a way to get the students more engaged in identifying and describing the areas they chose. What if, instead of another piece of paper to hand in, the students used video? Linda took the chance and in spring of 2010 changed this part of the assignment to a short video piece. Pleased with the results she opted to use video again this semester. As part of the first stage of the assignment, students complete a survey about the physical spaces on campus. Linda then organizes the students into groups based on the results. The survey responses serve as a storyboard outline for the mini-documentaries each group creates. Having watched presentations from two different classes it’s interesting to see how easily students gravitate toward what could be considered iconic areas of campus. The library, gym and football field always figure in there. The gazebo was also part of last year’s choices but didn’t make the list this year. A few places (such as the formerly alluded to dorm) are traditional in their “grossness” and “disgusting” attributes. 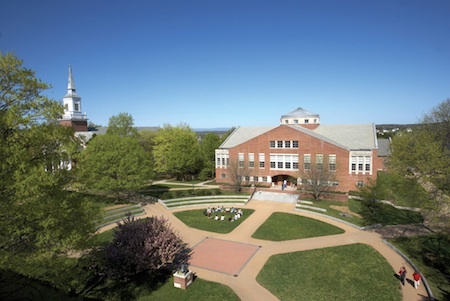 Students almost jokingly refer to “glarbage” and, while they’d like the food to be more appealing, the cafeteria is a prime spot for socializing and “glar watching.” In fact, several areas housed within Decker are rated highly for their conduciveness to socializing, whether it’s hanging out over a cup of coffee at the Buda Cafe, studying together in Ensor lounge, grabbing a bite to eat in the pub, or hanging out with friends just for the sake of, well, hanging out. “Overall, the results are to some extent consistent with the five elements of imageability that Lynch suggested. You point to buildings, open spaces/landscapes, vista points, with some being considered as landmarks. Similarly, despite this being a small campus, we can see the concept of district being applied as to when we move from one area of specified use to another: classrooms, dorms, Decker center, etc. The Red Square/Library and in some cases the library are considered as the center/heart of the campus. This conforms to the concept of nodes as suggested by Lynch. The Archway is an ‘edge’, signifying a break from the town and the college campus. Pretty interesting stuff. I know I will consider my favorite places on campus in a new light. What about you? Do you have a favorite spot on campus? Leave a comment and tell us about it and why it appeals to you. I’ve just recently given my first student-focused mini-workshop of the semester. Our topic was centered around the iMovie application and how its tools can be put to use in digital storytelling. It’s always a thrill for me to see the students take the short intro I give them and run with it. I encourage them to “play” with the tools and to put away any anxiety. Got an oops? No worries, here’s how you fix it. Shoulders visibly relax and a few smiles chase through the room. I field a few questions. Miscellaneous sound effects pop up here and there, along with the occasional laughter. One student has already taken the “Far Fay Away” title feature and crafted a re-write of the original Star Wars intro modeled on a burrito* theme. By the end of our hour together most of the students are focussing more on their computers than me, indicating, oddly enough, success. Students who have never used a video editing tool are fearlessly clicking away and trying things out—doing exactly as I’d hoped. Not every student workshop is as rewarding, but a good percentage of them are. Even more rewarding are the return visits when I’m invited to see the results of their work. If you read my previous post you know that I was very moved by the music videos produced by the World Music Survey FYS class last semester. I also enjoyed presentations by other classes. One group of students created a podcast styled as a radio talk show, complete with show host and book author acted out by the students. Another group modeled their video presentation on a television news show with panelists and visiting “expert” to offer topical commentary. Yet another group exercised their creativity by writing and performing their own rap song (see Latin Collaboration below) to share the highlights of their collective research. These are just a few examples. I have to offer a disclaimer here, though. Sometimes I get to attend presentations that aren’t related to any work I’ve done with the students. One such example is the “1889 World Exposition,” where students take on the personas of great artists such as Picasso, Seurat and Degas. You can see photos of the event on the CFE blog. Regardless of the reason I am fortunate enough to be invited for the presentations, I enjoy the opportunity to see how the students demonstrate their creativity. At times, you can almost feel the sense of eager anticipation circling the room as each group waits their turn to unveil their project. In the case of the “Exposition” everything seems to be happening at once. It’s a carnival of characters expounding their views to all and any within their periphery. Their enthusiasm is nothing short of contagious. To borrow a phrase from Latin Collaboration, “It might be a wild ride, so tie up your laces!” I look forward to more creative possibilities this semester. The rap artists from the Fall Afro-Hispanic Music class have given permission to share their lyrics here. Before reading, turn on your inner radio and tune up a catchy syncopated beat! Called New York City, better (better) than the rest. Cinquillo, trescillo, son clave and gahu, rhythms from a transported culture stuck like glue. The culture and the rhythm produce diversity. Their rhythmic drives, melodic trends. These sounds break down that cultural barrier. Music and words by Rachel Sidney, Greg Povlow, Kelsey Franklin, Aaron Donato, and Niya Wills. * To protect the student’s intellectual property I’m not posting a re-write here. Given it’s laugh-out-loud nature, however, the student was strongly encouraged to continue her endeavor. I’m so hoping for a YouTube debut sometime in the near future.